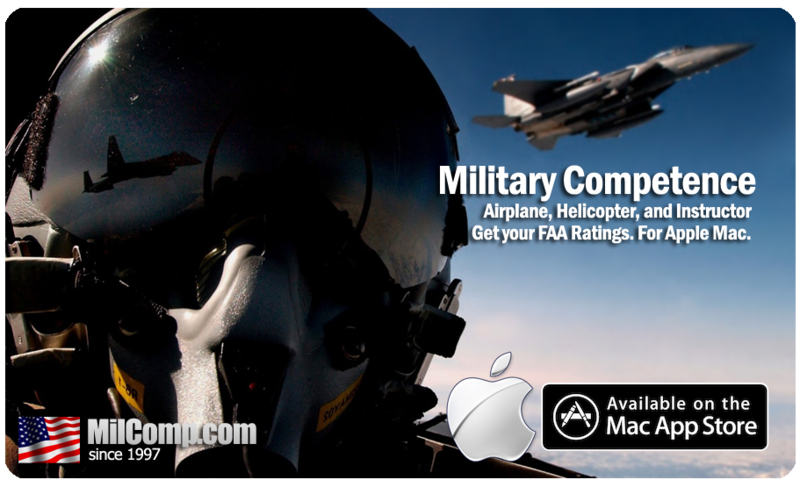 This Military Competence app can prepare you for any or all of the following FAA Knowledge (written) tests. Inside the app, you can select the specific test from the list below that you want to study for, and the app will then filter the questions to only those that apply to that test so that you don't study extra or unnecessary material. 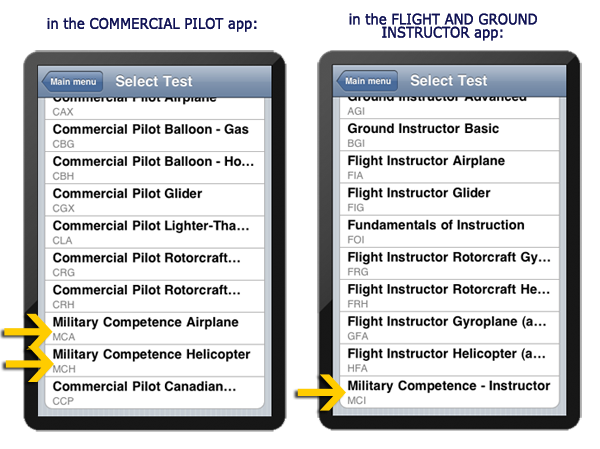 This Military Competence Instructor app can prepare you for any or all of the following FAA Knowledge (written) test. Inside the app, you can select the specific test from the list below that you want to study for, and the app will then filter the questions to only those that apply to that test so that you don't study extra or unnecessary material. To see our complete lineup of FAA written/knowledge test prep products for Mac™, Click here. The Mac™ apps on this page work great with your Mac desktop or Laptop - however, they are NOT intended for use with your PC, iPhone/iPad/iPod, Android device, or anything else. Things work great when you purchase Mac-compatible apps directly from the Mac AppStore™. These Mac apps (programs) have been needed to be specifically designed, programmed, and tested (a process involving hundreds to thousands of hours and specialized skills and tools) to work on Mac™ laptops and desktops and they certainly do work great on them. However, this also means that they work on Mac™ laptop and desktop devices only--purchases made via the Mac AppStore™ are not compatible with and will not work on, for example, your PC, iPhone/iPad/iPod or Android device. If you'd like to use a given app for both your Mac and its equivalent piece of software / app for your PC, iPhone/iPad/iPod, or Android device (where one is available), as some people do in order to get 'the best of both worlds', you would need to purchase these separately. This 'a la carte' system ensures that you pay for only that which you intend to use and is fair to all involved. At any rate, it could not be differently due to Apple's sensible policy that its Mac AppStore is for Mac apps only and effectively that no 'intermingling' is allowed. We thank you for your understanding that we are obliged to follow all other software vendors in following Apple's policies in this regard. Our Mac test preps for Military Comptetence Airplane (MCA), Military Competence Helicopter (MCH), and Military Competence Instructor (MCI) that will allow you to convert your miliary flight experience into civilian certificates and ratings are included as part of our overall "FAA Commercial Pilot" and "FAA Flight and Ground Instructor" test prep apps, respectively. Specifically, the MCA and MCH test preps are part of the commercial pilot app and the MCI prep is part of the Flight/Ground Instructor App. After you purchase the app and run it on your Mac laptop and/or desktop, it will ask you which test you want to study for - simply select MCA, MCH, and MCI as appropriate (they will be included along with several purely civilian tests in each app). This is a great way to prepare for your military to civilian conversion test wherever you are with your iOS™ device. 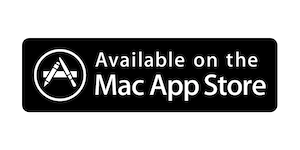 You can click on one of the links above to get more info about one of the two relevant apps here or to purchae it directly via the Mac™ AppStore™. Yes, these apps are 100% what you need to study for either your MCA/MCH or MCI FAA written tests. They include actual up to date questions, full explanations, all the charts and figures you will need and more. For more information on the process of converting your military experience, please visit our main Military Competence Conversion page. Yes, the content here is (essentially, if not 100%) identical to that of our very highly regarded Military Competence test prep PC software. Sorry, we cannot offer a discount for buying both of these at the same time nor can we offer a discount for bundling these wit our PC software. This is not our policy, but the policy of Apple via their AppStore which prohibits us from doing this. All FAA questions just like our FAA GroundSchool software has. Not some measely pared-down question set - you get the full thing complete with our detailed, illustrated explanations, allowing you to do all of your FAA knowledge test prep study right on your Mac laptop and/or desktop. Integrated Upgrades - get upgrades right into your Mac. So, when our editors change things, you get access to the latest and greatest quickly. This is REALLY IMPORTANT and we're the only ones that we know of that have this feature. Full, Illustrated Explanations. All charts and figures. Many advanceed features, including many study and learning modes. "Great software to get me ready for the Military Competence Exam - Airplane. Excellent resources made readily available to explain questions and foster deeper understanding and general knowledge of regulations. I passed the exam within 15 minutes and scored 100%. The FAA Operations Inspector who handled my paperwork said "Geez, 100%? Maybe you put in too much time on this one." Nope, just the right amount, thank you! Completely worthwhile product!"